You and your little one will be welcomed into our Little Star’s family by our experienced and fully qualified team of early year’s practitioners. The room itself is spacious and filled with natural light that floods in from the windows and patio doors, resulting in a tranquil environment that is the perfect atmosphere for our youngest children to relax in and thrive. The baby room is a sensory place, filled with materials, objects and resources for each child to touch and feel, explore and discover. There is a secluded sleeping area where the little ones can rest and enjoy a nap in their own bed. 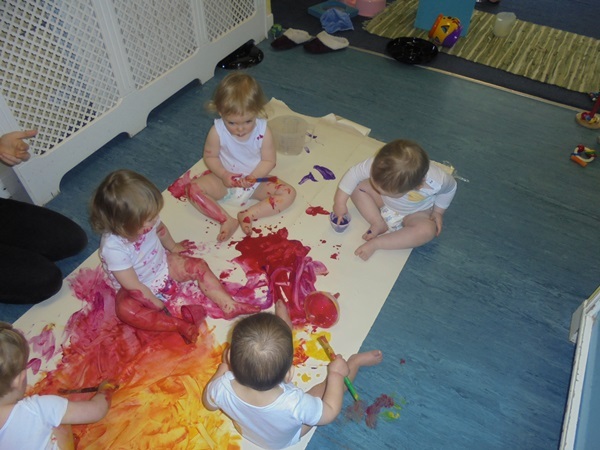 The babies are encouraged to be creative and have every opportunity to indulge their natural curiosities; whether that be through paint, music, planting in the garden or splashing in the water. 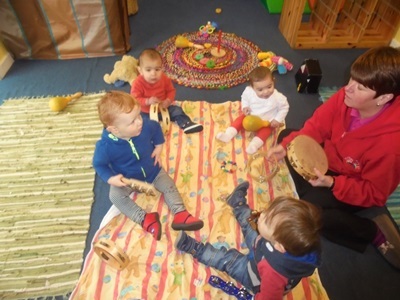 The babies spent part of everyday outdoors; either in their own secure and undercover garden or in the ‘baby bus’ which allows all the babies to get out and explore the local community. The babies love visiting the horses and duck pond as well as out to the park and Morrisons. We believe that good relationships with parents underpin all the good work we do at nursery and conversations we will have will enable us to put into place a care routine specifically tailored to your child. Your child will be assigned a Key Worker whose responsibility it will be to record learning and successes in their own personal learning journey. These portfolios are available for you to view at any time. We follow the Pre- Birth to Three and Learning Together in Dundee curricula which are specifically designed for us to facilitate the children’s holistic learning. All of your babies’ memories will be shared with you in their very own diary which you will be able to treasure forever. The Little Star’s Room is a home from home. For further information or to register your child at Happy Days, feel free to get in touch with us by calling 01382 500873 or submitting the form below.